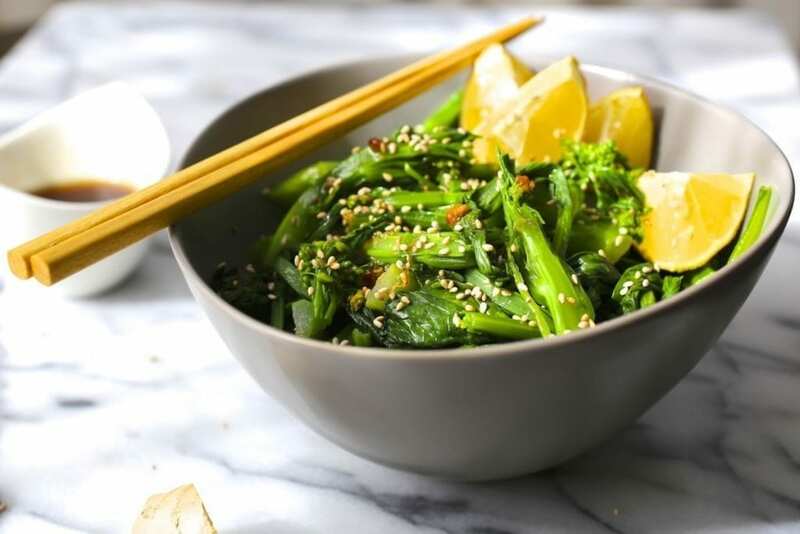 Chinese broccoli is a tasty variation of the standard green, and we show you one delicious way to cook it with a sesame citrus dressing. After what has felt like a gabillion months of (bone-chilling, face-freezing, fun-zapping) winter, this past weekend the sun peeked out from the behind the clouds and warmed our little corner of New York to a downright balmy 42 degrees. So we did the only sane thing and grabbed our sunglasses, slathered ourselves with SPF8000 and went swimming in a crystal clear lake and let the fish nibble our vitamin-D deficient toes. Just kidding! It was 42 friggin’ degrees so we braved the mud that is quickly replacing the permafrost in our driveway and drove to the little asian market we’d been itching to check out for ages. Sure, by NYC chinatown standards the place is tiny but it packs plenty of great products into its two crowded aisles. 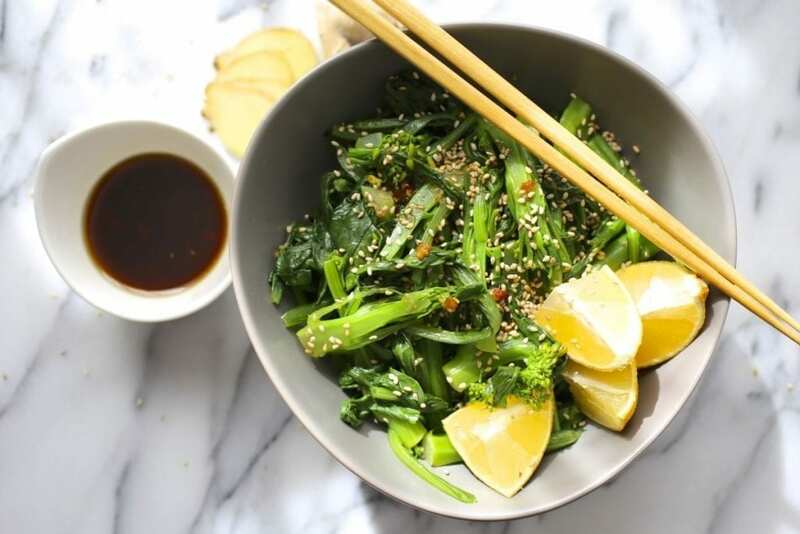 Among many other fun things, we bought a bottle of ponzu, some chili-garlic sauce, a big jar of sesame seeds and, best of all, a huge bag of incredibly fresh chinese broccoli. Aw yeah! Party at the Cliftons. Chinese broccoli is one of my favorite greens but I almost never see it at regular grocery stores so I was embarrassingly excited to pick up a big bag of it. If you’ve never tried it, it tastes kind of like a mix of bok choy and regular broccoli. It’s very mild and sweet and so easy to cook. I usually stir-fry it with chiles and garlic but, since I had just bought the ponzu, I decided to try it as a salad. 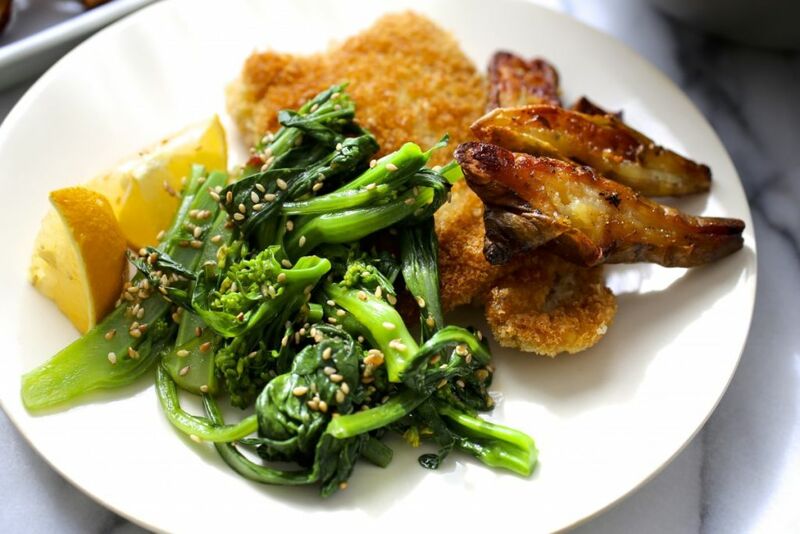 We also were already making chicken katsu so I wanted something light and refreshing on the side. Shee-niou, was it good. Can’t find chinese broccoli? Use broccolini or regular broccoli instead. 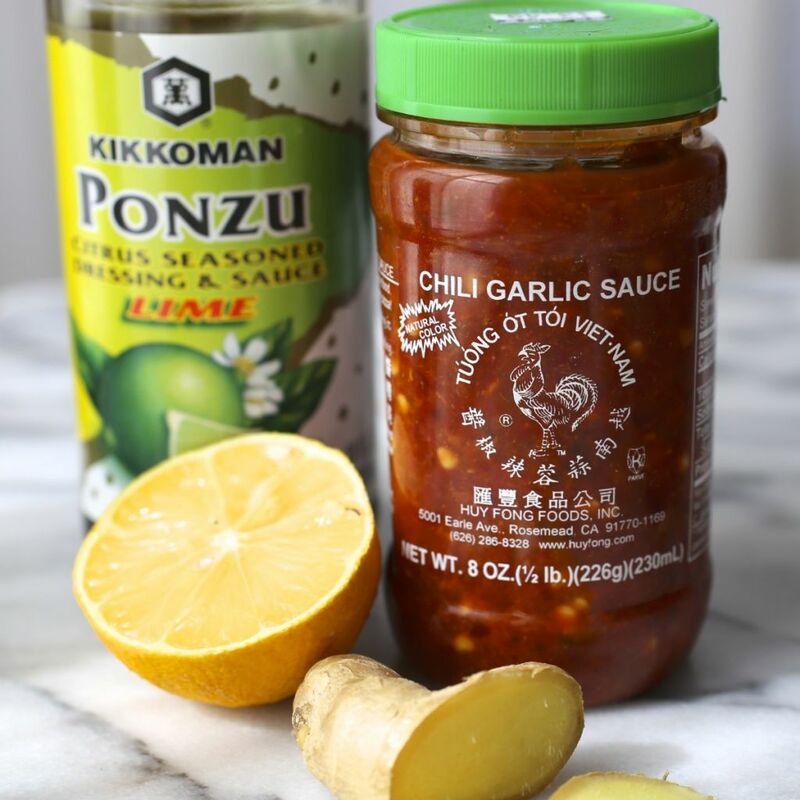 If you’re using sriracha instead of chile-garlic sauce, grate one small clove of fresh garlic into the dressing. This dressing is great on lots of different veggies and also works as a marinade for chicken or pork. 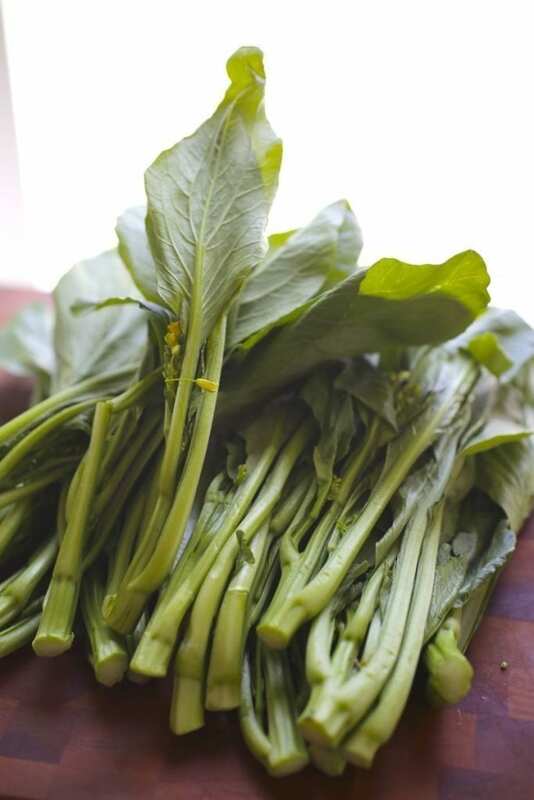 Trim ends from Chinese broccoli, then cut in half crosswise, separating the leaves from the stalks. 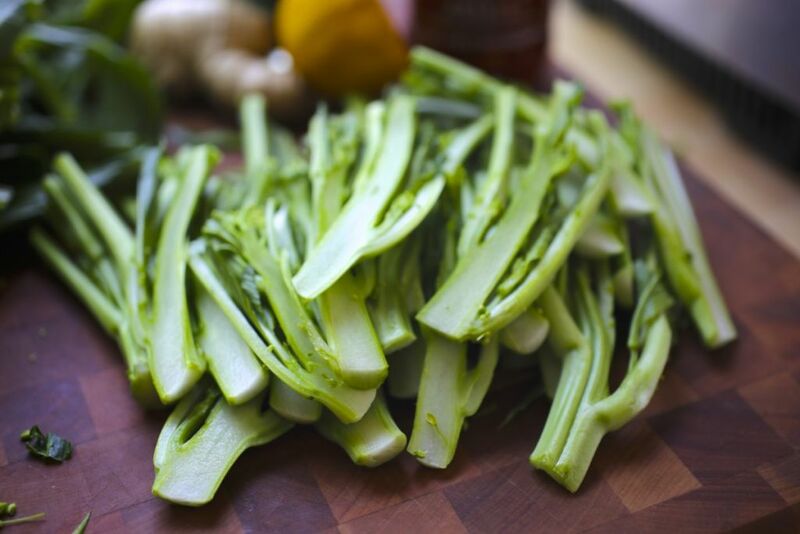 If any stalks are thick, cut them in half lengthwise. Heat about 4 inches of salted water in a large lidded pot or wok, bring to boil. Add the stems and cook for 2 minutes. Add the leaves and cook for 3 minutes more (stems should be tender but not mushy).Transfer broccoli to ice bath. While the broccoli cools, prepare the dressing. Combine ginger, ponzu sauce, lemon, soy, and chili sauce in a small bowl, then slowly drizzle in the sesame oil, whisking constantly. Set aside. Drain the broccoli and dry well (in a salad spinner or with a clean kitchen towel) then transfer to a serving bowl. Drizzle dressing over broccoli and toss to coat evenly. Sprinkle sesame seeds and serve.